MUMBAI, India (CNN) — More than a day after gunmen stormed ashore and attacked at least seven locations in Mumbai, killing 125 people, members of India’s premier counterterrorist force early Friday were seeking to end standoffs at the two luxury hotels and Jewish center that were attacked late Wednesday. 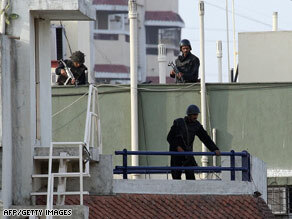 Indian army commandos are shown on the rooftop of Nariman House in Mumbai on Friday. Fighting broke out early Friday between government soldiers in a helicopter and gunmen holed up inside a Jewish center where two or three gunmen were believed to be remaining. The helicopter dropped off seven or eight soldiers onto the roof of the Chabad house, and then moved away from the line of fire, CNN sister station CNN-IBN reported. The operation followed after grenades had been tossed from inside the structure toward anyone approaching the building — three such explosions occurred in four hours. But movement appeared imminent shortly before dawn, when several jeeploads of police, firetrucks and at least one ambulance pulled up to the five-story structure. The fighting at Chabad house comes as Indian security forces appear to be gaining control of two Mumbai five-star hotels attacked by gunmen in a wave of violence that has lasted more than 24 hours and killed at least 125 people. A gunman was killed around 1 a.m. in the Oberoi hotel, where commandos were going room-to-room, trying to flush out attackers and rescue people, J.K. Dutt, the director of India’s National Security Guard, told CNN-IBN, CNN’s sister network in India. Dutt said he could not say how many gunmen remained in the Oberoi, where hostages have been trickling out of the building for hours. Security forces used in-house telephones to ask guests holed up in their rooms to switch on lights and open curtains, so that they could provide cover, CNN correspondent Andrew Stevens reported. A siege at the nearby Taj Mahal hotel was over, CNN-IBN reported, but one gunman remained holed up there early Friday morning, Dutt told IBN. Police sources said at 2 a.m. Friday that they believed the gunman was wounded and getting tired. Dutt said his teams had rescued most of the hostages inside the Taj, but an undetermined number of people remained inside. One woman expressed frustration over the lack of information regarding her sister and niece, who have been trapped inside the Taj for nearly 30 hours. “I have whatsoever no information as to what’s being done to rescue them,” said the woman, who did not give her name to CNN. Deepak Datta told CNN that he waited in his room at the Taj, listening to gunfire, for almost 24 hours before commandos rescued him. Elsewhere in the city, a standoff continues at a Jewish center in the city, a spokesman for the Israeli foreign ministry said. For hours, gunfire and grenades were tossed from inside at anyone approaching the building, with three such explosions occurring in four hours. It is unclear who was responsible for the series attacks, which hit several high-traffic landmarks in the city, including the hotels, a hospital, a train station and a popular tourist cafe. But whoever planned the attacks spent months coordinating them, even setting up “control rooms” in the two hotels targeted, the Press Trust of India reported, citing Union Cabinet Minister Kapil Sibal. “Enormous planning went into the incident. The terrorists were dropped by a mother ship and traveled in rubber boats which they docked (at Mumbai),” Sibal said. The death toll from the series of coordinated attacks was at 125, by Friday morning, authorities said. Among the dead were at least six foreigners, three top law enforcement agents, including Hemant Karkare, the chief of the Mumbai police’s anti-terror squad, and 14 police officers. Another 327 people were wounded in the attacks, including seven British, three American and two Australian citizens. Indian Prime Minister Manmohan Singh suggested the group behind the terror attacks was based outside the country. “It is evident that the group which carried out these attacks, based outside the country, had come with single-minded determination to create havoc in the financial capital of the country,” Singh said. At least nine gunmen were killed in fighting with police. IBN quoted police sources as saying they believed there were around 26 gunmen, most of them young. Indian officials have told Canada that they believe six Canadians are being held hostage, according to a senior aide to Prime Minister Stephen Harper. The French Foreign Ministry said 15 to 20 French nationals were trapped in the two hotels. Authorities found 8 kilograms (17 pounds) of RDX, one of the most powerful kinds of military explosives, at a restaurant near the Taj, indicating that the attackers may have been planning more violence. Gunmen also remained holed up in a building called Chabad House, where several Jewish families live. Rabbi Gavriel Holtzberg, the city’s envoy for the community, was being held inside with his wife, a member of the Hasidic Jewish movement said. Two women and a child were seen escaping from the building, said Johny Joseph, chief secretary of Maharashtra state. CNN-IBN reporter Raksha Shetty said three people escaped — apparently a caretaker, a cook and a child. Israel’s Haaretz newspaper reported later that Sandra Samuel — a cook for the center who had barricaded herself in a room in the house — told them she grabbed a toddler whom she identified as Holtzberg’s son and fled the building, along with another person. “I just grabbed the baby and ran,” Samuel told Haaretz. Police said gunmen fired indiscriminately from the building. Stray bullets killed a couple in their home and a 16-year-old boy who stepped outside, police said. A standoff at a fourth location — the Cama Hospital for women and infants — appeared to have been resolved by Thursday morning, CNN-IBN reported. The Indian navy, stepping up patrols on the country’s western coast after the attacks, boarded a cargo vessel Thursday afternoon, officials said. They and the Indian coast guard were also searching for a small boat in the Arabian Sea. Nine suspects were arrested in connection with the attacks, including seven fishermen. Police also found a boat loaded with explosives near the Taj’s waterfront location. “Those men were wearing jackets and they carried big big bags,” one fisherman told CNN-IBN. “We asked, ‘Where are you coming from?’ They said, ‘Go do your work,'” another witness said. The gunmen then hijacked cars — including a police van — and broke up into at least three groups to carry out the attacks, police said. As police rushed to the scene of the attacks, gunmen attacked the Cama Hospital. Two other groups attacked the Oberoi and Taj hotels. Several Indian news outlets reported receiving e-mails from a group calling itself the Deccan Mujahideen, claiming responsibility for the attacks. CNN was not able to verify the reports. Reaction from the United Nations, United States and United Kingdom was swift as world leaders joined in condemning the attacks. CNN’s Andrew Stevens, Mallika Kapur, Phil O’Sullivan, Phillip Turner, Ravi Hiranand, Yasmin Wong and Harmeet Shah Singh contributed to this report.